Good morning everyone! 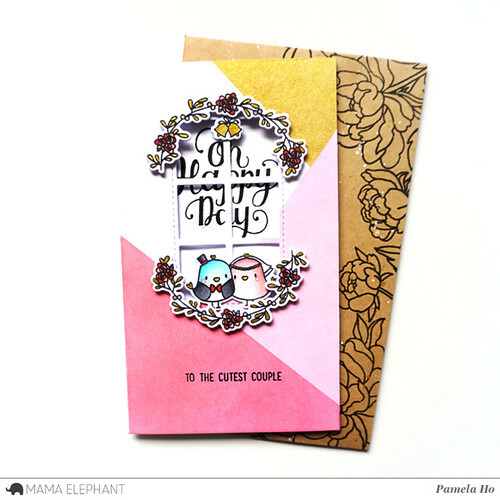 This is Pamela with Mama Elephant and I've got a card to share with you using the May release Basic Rectangles creative cuts. May to September is basically "wedding season" here in Vancouver, so I've got a simple wedding card to share with you today! First, I blended a few colours onto my card base. Since the wedding invitations had pink bits here and there, I decided to incorporate their wedding's colour scheme into the card. I did some colour blocking using dark pink, light pink and a little bit of gold. 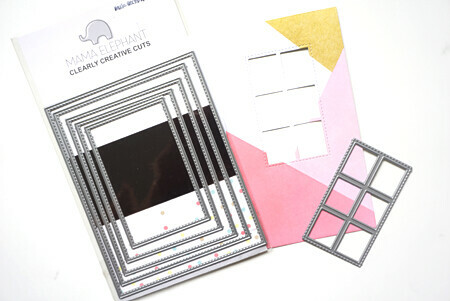 I then die cut the window in the middle using Basic Rectangles creative cuts. 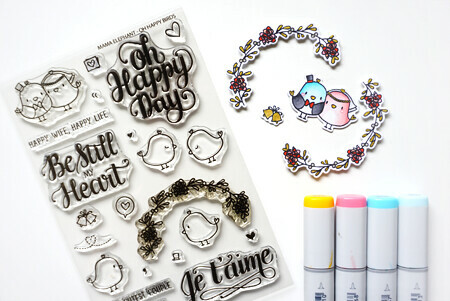 I whipped out the perfect stamp set for weddings - Oh Happy Birds stamp set. I stamped out the flower wreaths, the two little birdies and the bell and coloured them in. 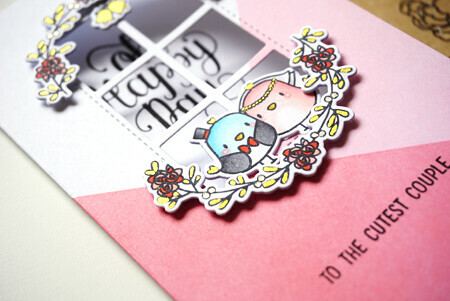 On the inside of the card, I stamped the sentiment "Oh Happy Day" from the same stamp set. This sentiment would appear in the window from the card front. I stamped "To The Cutest Couple" onto the front of the card and prepared to adhere all the little bits and pieces onto the card front.